Thalwil, Switzerland – February 17, 2016 – u-blox (SIX:UBXN), a global leader in wireless and positioning modules and chips, announces the release of NEO-M8U, the industry’s first Untethered 3D Dead Reckoning (UDR) module. Combining multi-GNSS (GPS, GLONASS, BeiDou, Galileo) with an onboard 3D gyro/accelerometer, NEO-M8U provides accurate positioning even where GNSS signals are weak or not available. It achieves this without any connection to the vehicle other than power. 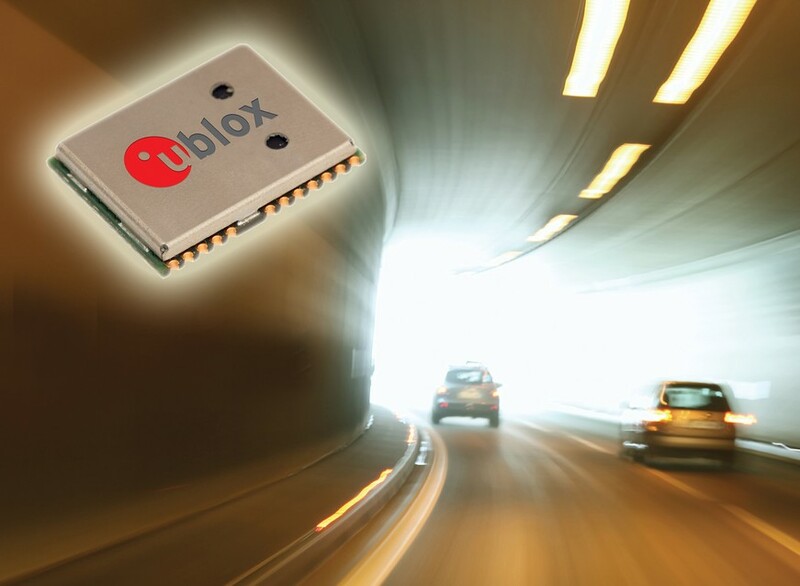 The u-blox NEO-M8U module provides superior multipath suppression, which improves position accuracy even in tough environments, such as urban canyons, tunnels, or parking garages. For example, in London’s city center area, NEO-M8U is typically three times more accurate than a traditional GNSS receiver. In addition, NEO-M8U offers instantaneous position immediately after power-up, without the need to wait for a first fix as with regular GNSS receivers. One of the key advantages of NEO-M8U is the ease of product development and installation. NEO-M8U looks and behaves just like a regular GNSS receiver and does not require any special mounting or connection to the vehicle. Thanks to its intelligent sensing and continuous self-calibration, NEO-M8U can be installed in the vehicle in any orientation. Other features are its real-time update rate of up to 20 Hz benefiting a smooth navigation behavior, as well as the high-speed access to the raw sensor data allowing for driving behavior analysis and detection of sudden acceleration, such as during an accident. NEO-M8U will be available in early Q2, 2016. It can upgrade any existing NEO design due to the inherent pin and software compatibility to other NEO modules. NEO-M8U will be displayed at the u-blox booth (Hall 5: 5-158) of Embedded World. Swiss u-blox (SIX:UBXN) is a global leader in wireless and positioning semiconductors and modules for the automotive, industrial and consumer markets. u-blox solutions enable people, vehicles and machines to locate their exact position and communicate wirelessly over cellular and short range networks. With a broad portfolio of chips, modules and software solutions, u-blox is uniquely positioned to empower OEMs to develop innovative solutions for the Internet of Things, quickly and cost-effectively. With headquarters in Thalwil, Switzerland, u-blox is globally present with offices in Europe, Asia and the USA.